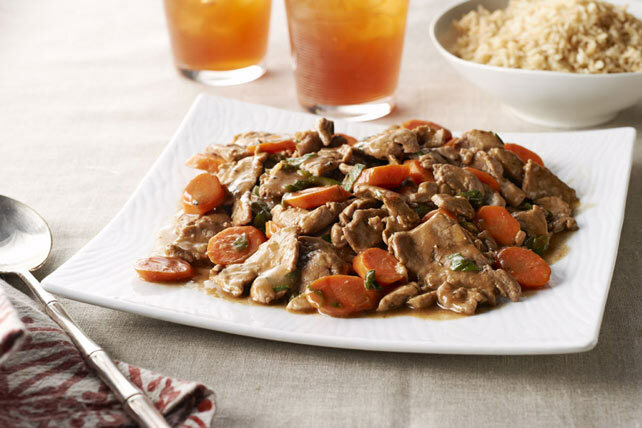 Thin strips of pork tenderloin, sliced fresh veggies and an easy-to-make sauce...they're all part of a Healthy Living dish that you could enjoy tonight! Heat oil in large skillet on medium-high heat. Add meat and carrots; stir-fry 5 min. Stir in dressing and hoisin sauce; stir-fry 7 min. or until meat is done and carrots are crisp-tender. Add onions; stir-fry 1 min. For browner meat, toss meat strips with 1 tsp. cornstarch before stir-frying as directed. Serve over hot cooked rice or angel hair pasta.